Is your “social intelligence” costing you money, opportunities, and friendships? These SECRETS contain the most powerful, life-changing skill you'll ever learn. Discovering these secrets not only improves one area of your life — it improves multiple areas of your life. The areas in your life that count: Your career. Your wealth. Your relationships. Your happiness. Yourself. I bet you'd like to know the secrets, wouldn't you? In fact, I'll reveal them shortly. But first, think back to a time when you've been totally engrossed in a conversation. You're there talking, and you feel great rapport with this person, when suddenly you find yourself totally absorbed in the moment. Your breathing slows down, you feel a warmth inside, and the person has your complete attention. Picture a guy named John at his job. His phone rings. It's the boss. "Be in my office in five minutes. I want to talk to you about something." "That didn't sound good," John thinks. "I've been doing a good job. I wonder what this is about?" As he walks into his boss's office, he sees his boss and a co-worker named Brian, a guy who has been with the company for about six months. John's familiar with him because up to now Brian has been reporting to him. They all acknowledge each other and sit down. The boss says, "I've got some news, John. We've created a new position for Brian, and you will now be reporting to him." What a slap in the face! John has more experience than Brian. He has a better education and a stronger skill set, from a technical point of view. He can't imagine how this could have happened. Well let me tell you, things like that happen all the time in business. How do you think all those people who never went to college became millionaires? Experience? Education? Deal with difficult or angry people (all you have to do is listen, then ask one important question). You see, every communication is an attempt to persuade someone else to do or avoid doing something, either now or in the future. You either ask outright or you imply your message in various ways. How effective you are at both the overt and covert ways of communication determines how successful you will be in any area of life. The hardest part of communication is learning to use language in the first place. But you already did that as a child. When it comes to refining your already remarkable gift for communication - that's just icing on the cake. Of course, it's the icing that makes the difference. Just as champion sprinters are only a few hundredths of a second faster than the rest of the pack, so the great communicators are men and women who've mastered just a few techniques unknown to the rest of us. This is the secret highly successful people have always known. From boardroom tycoons to those "life of the party" people, getting what you want is always about using words to get other people to open up to you - to want to help you. And that's a lot easier than it may sound. Because the fact is, people are programmed to help you. . . as soon as you talk to them in the right way. 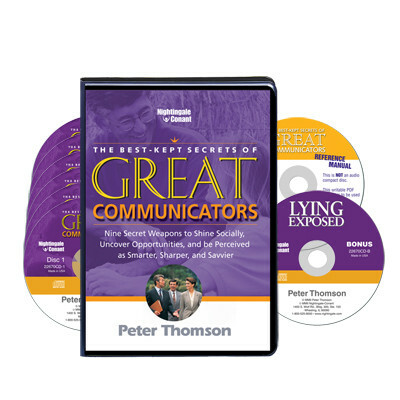 That's all explained in "The Subconscious Encoding Process," which is session three of Peter Thomson's audio program The Best-Kept Secrets of Great Communicators. This encoding process forms the basis of many of Peter Thomson's most powerful techniques - all of which seem so simple once they're explained. Yes, I want to gain respect, career opportunities, and wealth — all by gaining a verbal advantage in any encounter. I can order today at a special discounted price! And the best news is that you can develop your own highly persuasive conversation power very quickly indeed. The Best-Kept Secrets of Great Communicator scan reduce or eliminate the stress in your life. Stress is frequently caused by frustration - which is frequently the result of not being able to communicate effectively! The fact that you're reading this email proves you've mastered language that you already know 99 percent of what you need to know to be a highly successful communicator and reap all the rewards that go to the conversation winners. Isn't it worth spending a moment of your time now to find out the secrets of the elite 1 percent which makes all the difference?